Do you see that retro-looking device above? That's a cathode ray tube amusement device, one of the one of the first interactive video games ever made. You can tell by the circular green display that this missile simulator game was inspired by the radar displays of World War II. It was created and patented by Thomas T. Goldsmith, Jr. and Estle Ray Mann in the late 1940's. Not just inspired by radar screens... this is largely the same machine they used to do the calculations for real. Its one of the ways they demonstrated that computers could be, you know, useful. 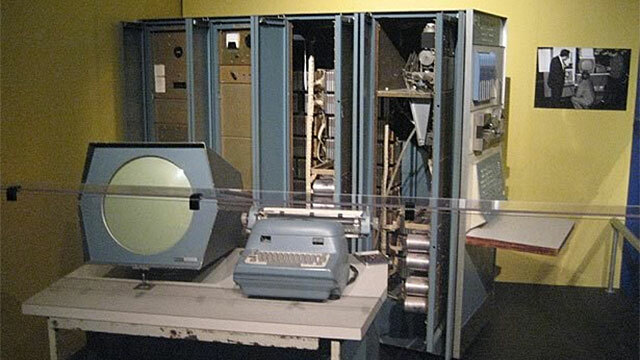 Actually, the picture shows a PDP-1 where the game SpaceWar! was programmed in 1961. It has nothing to do with the 1947 CRT Amusement Device by Dr. Goldsmith Jr.